The villa is situated in the beautiful Emerald Island Resort, regarded as one of the best resorts in the area. It is located south of the 192 near Mile Marker 5 just minutes from I4. 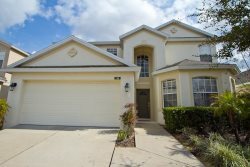 It is approximately 4 miles to the gates of Walt Disney World and within easy reach of both Orlando International and Sanford Airports. Other Florida attractions such as Universal, Sea World, Busch Gardens and Kennedy Space Center are within easy driving distance. The Gulf Coast can be reached in 90 minutes while the Space Coast can be reached in under one hour. Why rent this home when so many others are available - simple Location, Location, Location!! Not only is the resort overflowing with things to do its one of the closest high quality resorts to Disney. Emerald Island caters to all members of your family as it has tennis courts, a basketball court, a children's playground, a gym two communal pools and even a tiki bar the adults!!. The Clubhouse also has a Sauna, video game and internet cafe. The gated resort has quiet roads and is fully sidewalked, go for a stroll and along the way you will see many nature walks, as part of the resort is kept as a wildlife reserve. You will be amazed at the quietness of the resort perfect for enjoying relaxing quiet days/evenings around the pool. It's sometimes hard to believe that you are only minutes from the noise of Disney and the tourist areas/shops. You have your own personal pool (recommend heating from Oct - Jan) and covered porch area for relaxing outside. The pool deck furniture consists of a round table, 3 loungers and 4 chairs which are tubular with cushions along with a safety net. There is plenty of privacy at the near as there is a large open space behind the property. Unlike some other properties you can enjoy the pool without the feeling the neighbours are too close! There are two Master bedrooms, (with king and queen size beds respectively) the King having its own en-suite bathroom and a safe is provided for your valuables. The third and fourth bedrooms both have twin beds. All bedrooms have flat screen cable TV's - 32" in the masters and 24" in the twins. The home has a variety of Entertainment options to appeal to all ages. A selection of DVDs, games, books and toys for the pool are available. The main TV has thousands of free movies/TV shows via Amazon Instant Video. In addition a games room is provided with a pool and air hockey table, with a chill out area (with seating) to entertain when away from the parks. There are many shops, restaurants and supermarkets nearby including a Win Dixie, just around the corner off Formosa Boulevard which are located within minutes of the villa. Emerald Island Resort is the perfect base to see what Orlando and the rest of Florida has to offer. New TV's and Master bedroom for 2015! The property is managed by a local company with a 24hr emergency number - for complete peace of mind.